Last view: 41 days ago The DSi Camera utility stores some Exif header with AES signature in JPEG files, and refuses to load any JPEGs without such signatures from SD card. The 3DS is probably having same/similar JPEG signatures. Last view: 520 days ago I remember trying to feed a custom-made image into my 3DS and it would read it fine. Maybe the signature just serves to identify which files were taken from the DSi/3DS? Would be a lot of trouble for nothing though. Last view: 1245 days ago Is there a way to "set" a date for the picture that the 3DS recognizes it? Normally it would be 01-01-1900 if unknown. I remember trying to feed a custom-made image into my 3DS and it would read it fine. I can confirm this at least for MPO files (3d images, basicly 2jpegs with special exif markers). EDIT: Just confirmed it, any JPEG file works as long as it follows the naming convention of the camera app. Last view: 41 days ago Hmmmm, no issues importing JPEGs to 3DS? A while ago, I've read this: http://www.hjort.co/2011/09/transferring-photos-to-nintendo-3ds.html and that sounded as if would be difficult to import images. Or maybe it's been really just a filename issue all the time ;- ) apart from needing to follow the filename notation, the files must be also listed in "pit.bin" on DSi (ie. one could replace existing files with same name, but couldn't add new files with different names). Now I am wondering if the DSi did really ever have had any issues, too... Just tried... Yes, the DSi does refuse even minor modifications of photos taken on DSi. 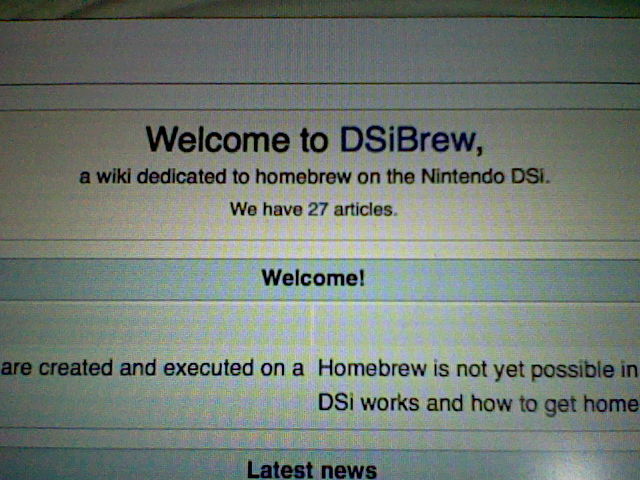 I've used the above sample image from dsibrew (and verified that I can view the original image on my DSi). Then I changed the three date strings from "2009:05:23" to "2009:05:24" in a hex editor, and, after that change, the DSi does just display "?, Cannot display image". My DSi has some portions of the firmware downgraded, but the DSi Camera utility should be from most recent firmware upgrade. Last view: 1157 days ago I remember having big issues getting any modified JPEG to show up. Perhaps they resolved it in a firmware upgrade..
Last view: 822 days ago For me it worked since like always. Just had to adjust the file name. Okay, so the 3DS appears to store DSi-compatible signatures in the JPEGs. EDIT: Or did you mean that you've tested it... and the test has FAILED? Yes, would be great if you could upload a photo taken on 3DS somewhere, just to see if the signature is really there, and if they have changed the "NintedoDS" string to "Nintendo3DS" or the like. Last view: 1157 days ago I'm almost 100% certain that 3DS Camera checked this signature thingy way back..
Last view: 41 days ago Any news? First lots of people posted about JPEGs... and then nobody managed to dump a JPEG from 3DS? Are there tech problems? I could supply some tutorial on How-to-export-JPGs-on-DSi (if that should be really needed, but don't know if that info would apply on 3DS, too). Does the 3DS support copying .JPGs to SD card at all? Or does it only allow to export .MPO's? For uploading a 3DS .jpg, http://dsibrew.org might be a good place (since the forum doesn't seem to support attachments, and http://3dbrew.org seems to be blocked via some obscure captcha). PS. seeing a .MPO file from 3DS would be also interesting. Are that files compatible with JPG viewers (eg. allowing to see the "left" half as normal 2D image)? Last view: 1201 days ago I took a photo and a video on my o3DS which has System Version 9.5.0-22E. Do you want me to copy and paste something from my DSi? Yes, .mpo files are simply two jpeg files joined together and all jpeg viewers show just the left half as a normal 2D image. MySQL - queries: 28, rows: 91/91, time: 0.015 seconds.